[dropcap]T[/dropcap]he big Conservative Party leadership contest ended on Saturday with Andrew Scheer winning. 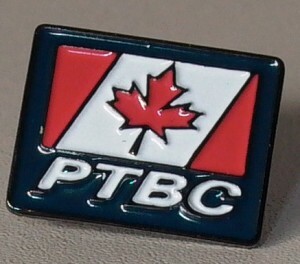 Where did Vancouver’s The Province (a Postmedia paper – same owner as National Post, etc.) put the story on Sunday? Page 30. Yeah no, not the front page. Not page 4. Not page 11. Not 16. Not 26. Page 30. The story — an important one by any measure if you are of a sound or fair or balanced journalistic mind — and one which is of interest to and which ultimately affects all Canadians, is not even mentioned or teased on the front page. And by the way, page 30 is their last page of news before the Obituaries section and Sports. The far-left NDP meet in October to pick their new leader. Wanna guess where that story will be situated, and how many pages at the very front of the paper will be dominated by that story? P.S. 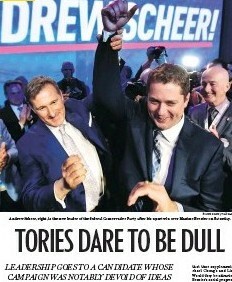 on Monday morning, the Vancouver Sun (same owner): story finally found, 13 pages in — with this headline: “TORIES DARE TO BE DULL”.